“Yötön yö” is a Finnish phrase which literally means “nightless night.” I came across the phrase during a trip to Finland in the fall of 2011. It refers to that time of year in areas north of the Arctic Circle when the sun never quite sinks below the horizon for days, even months, on end. In English this is usually referred to as the “midnight sun,” and indeed “yötön yö” is often translated that way. However, I much prefer the literal rendering; its inherent self-contradiction strikes me as being very poetic. I have never experienced this phenomenon, but people apparently react in very different ways to living day after day without any true darkness, some finding it mystically beautiful, others exhilarating, still others depressing and difficult to deal with. Insomnia is a common experience, especially among visitors, but sometimes even among natives of these far-northern places. And of course, the same person may react differently as the endless days wear on. 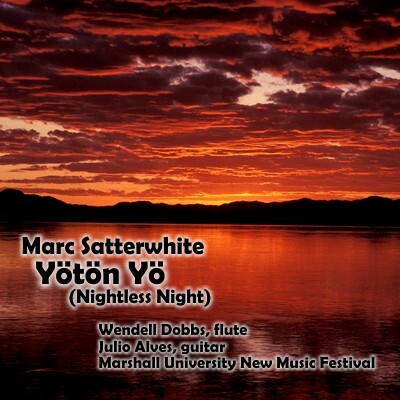 Yötön Yö was written for my colleagues at the University of Louisville School of Music, Kathleen Karr and Stephen Mattingly, wonderful players individually and a terrific duo as well. In it I explore the conflicting moods one might experience during the long “nightless night,” ranging from introspective through manic. It is in a single movement lasting about nine minutes. Although for most of the piece both instruments play conventionally, I have also explored some less-traditional sounds and methods of playing in an attempt to convey the mysteries of this experience, or at least my imagination of those mysteries.